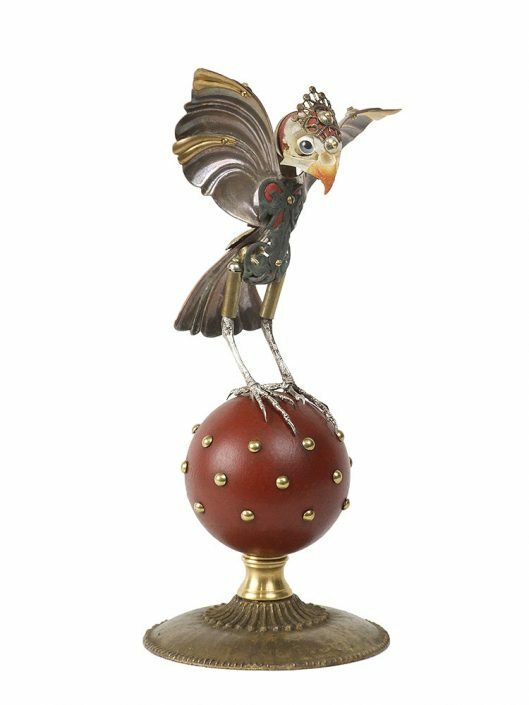 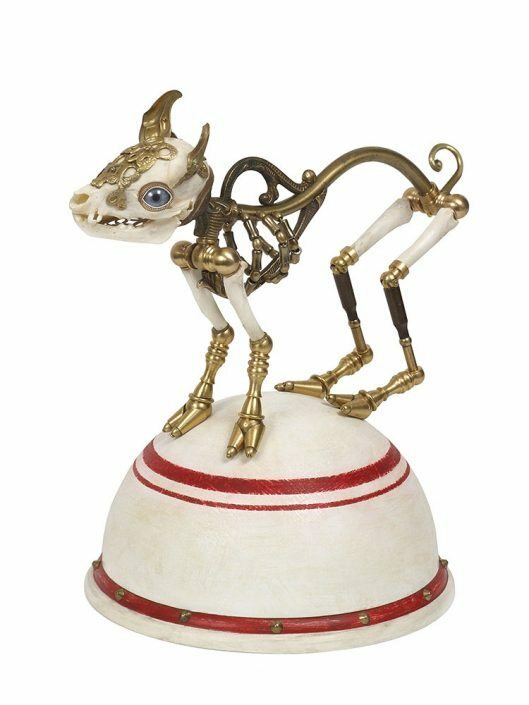 The works of David Kroll and Jessica Joslin are decidedly different; Kroll’s delicate oil paintings appear at first reminiscent of the still-lifes of the Dutch Golden Age, while Joslin’s oeuvre comprises a menagerie of bone-and-bauble creatures, unheard-of biological specimens pieced together with a metalsmith’s precision. 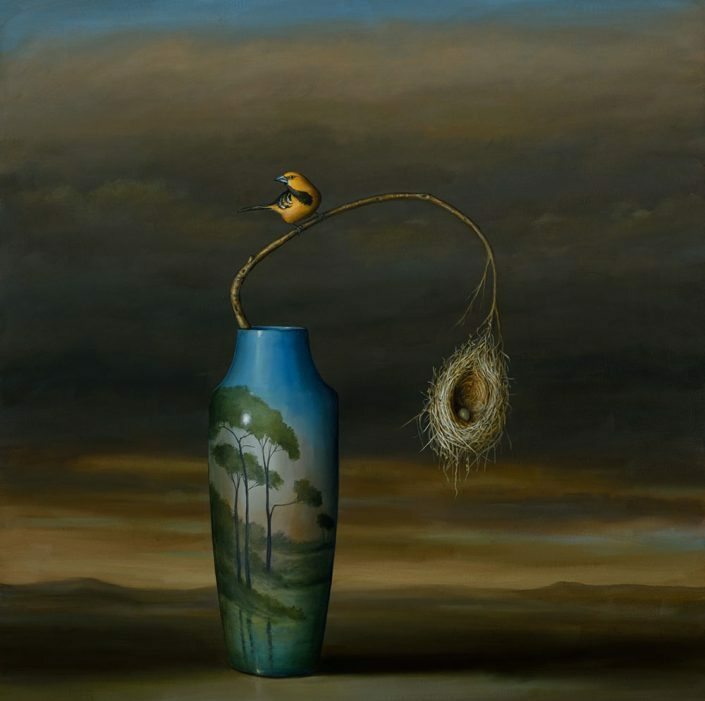 Yet the artists share a detailed knowledge of mysterious, timeless inner worlds, and both dive deep in order to bring forth scenes and creatures from their enchanted subconscious. 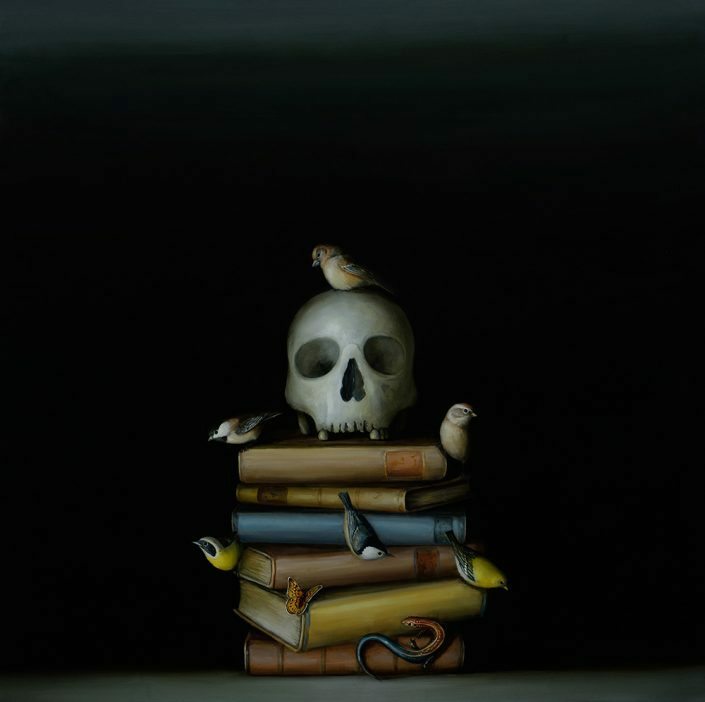 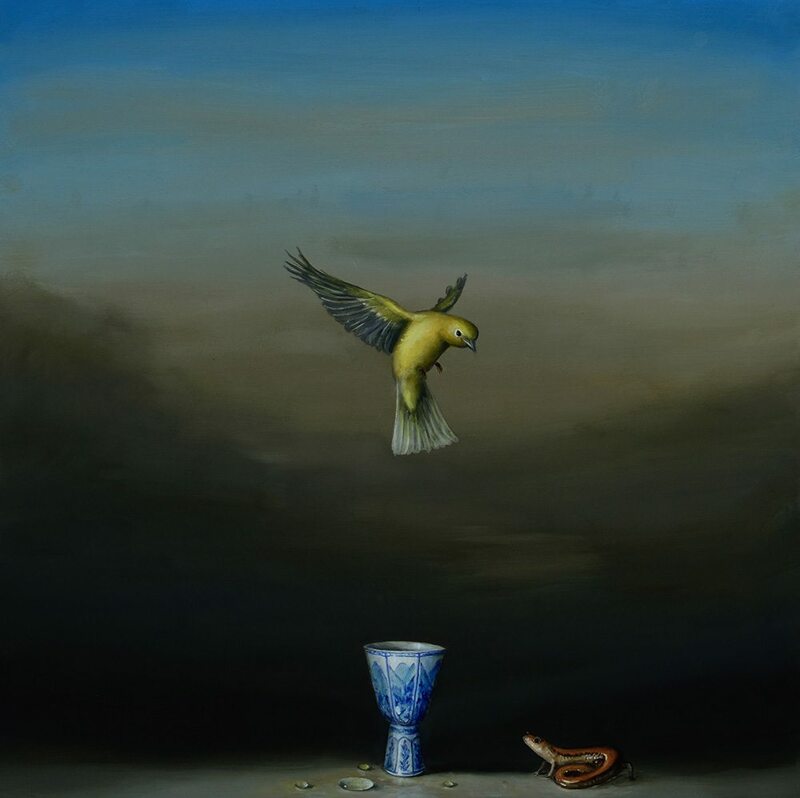 David Kroll’s still lifes are continually unfolding mysteries, portrayed with a sure and immaculate compositional hand. 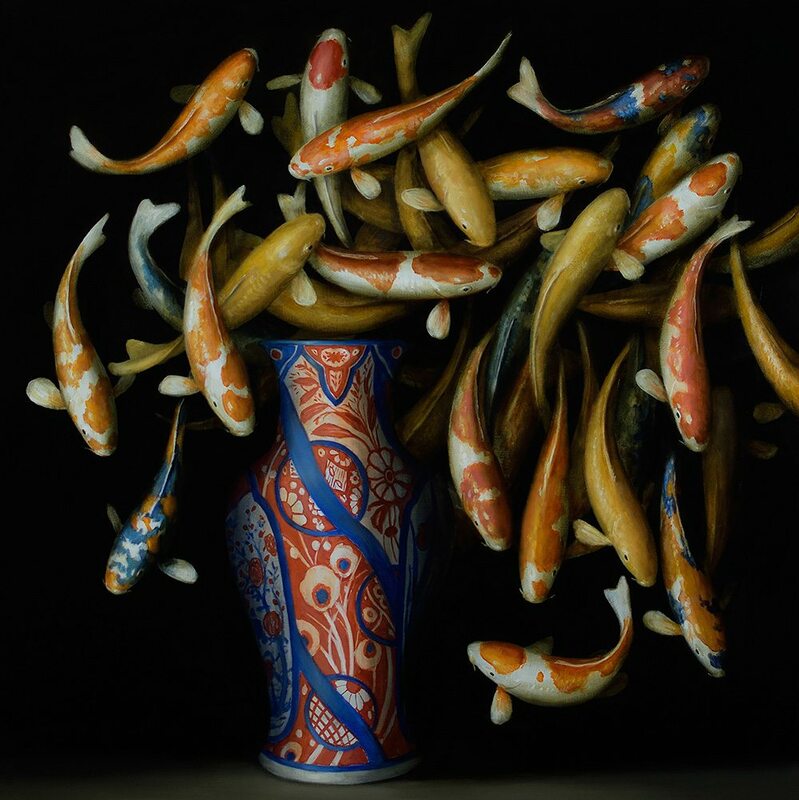 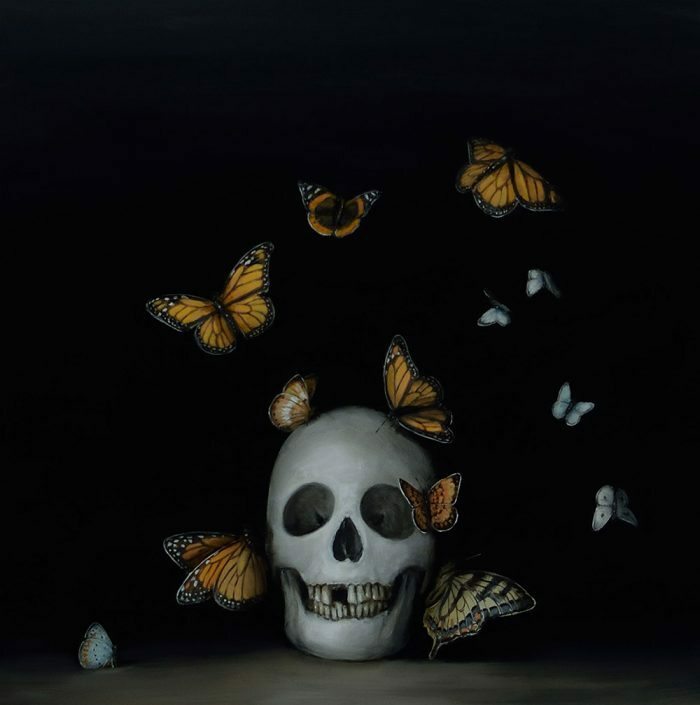 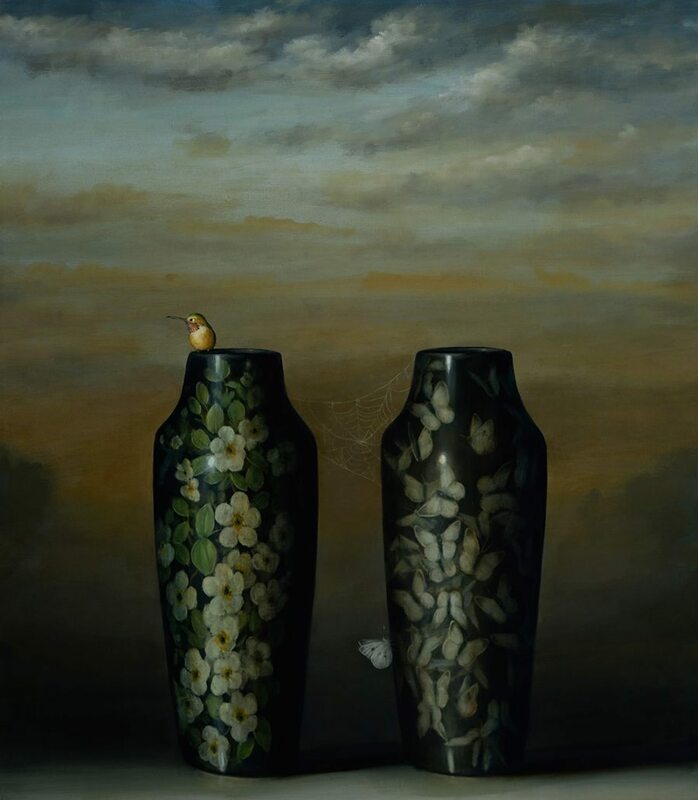 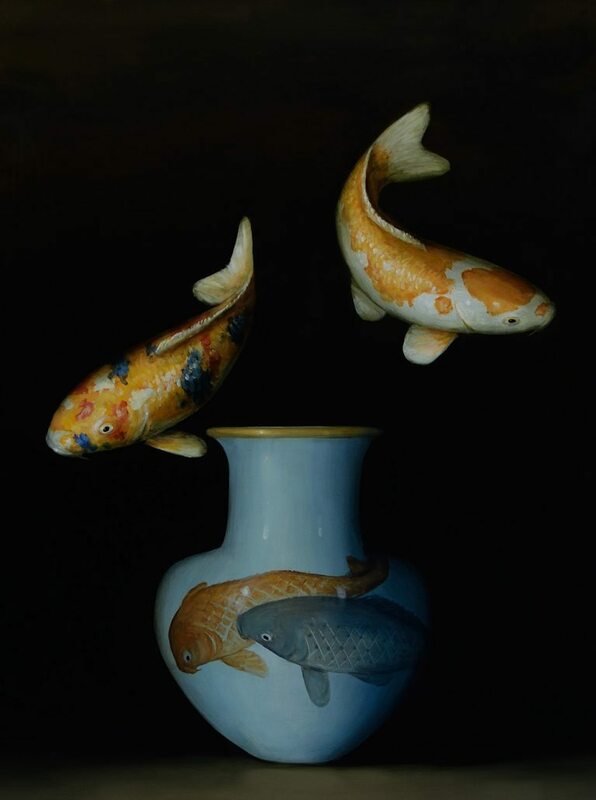 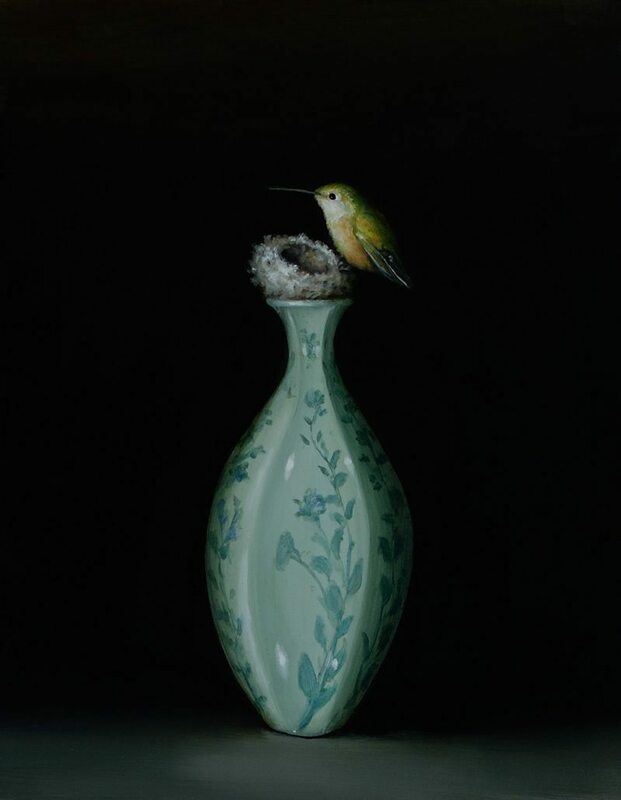 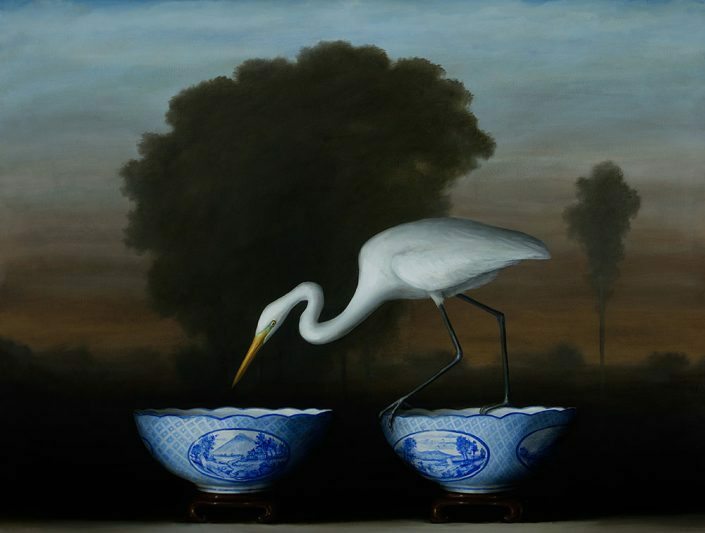 Kroll’s deft touch as a realist belies his works’ constant internal magic: in each still life there is an otherworldly intervention or compositional sleight of hand; a landscape echoing from background to vase, a fluttering of ethereal wings in the darkness that indicates the ceaseless motion of the living world. 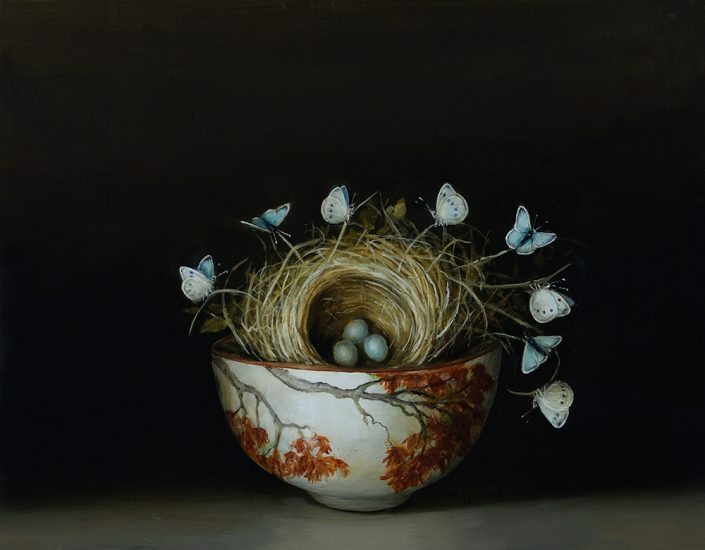 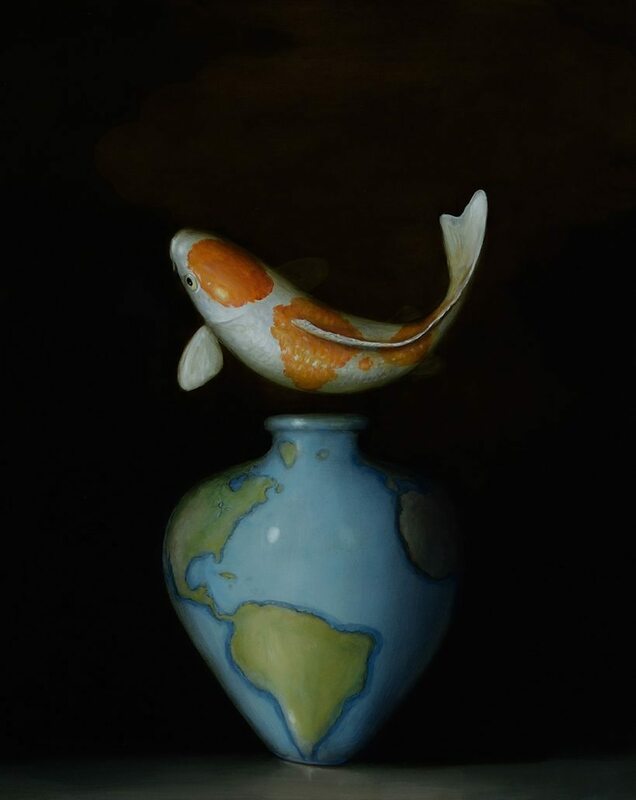 The natural world in Kroll’s works is frequently mediated through man-made objects or references–vessels, globes, and memento mori, portrayed with the same lush elegance as the natural environment surrounding them. 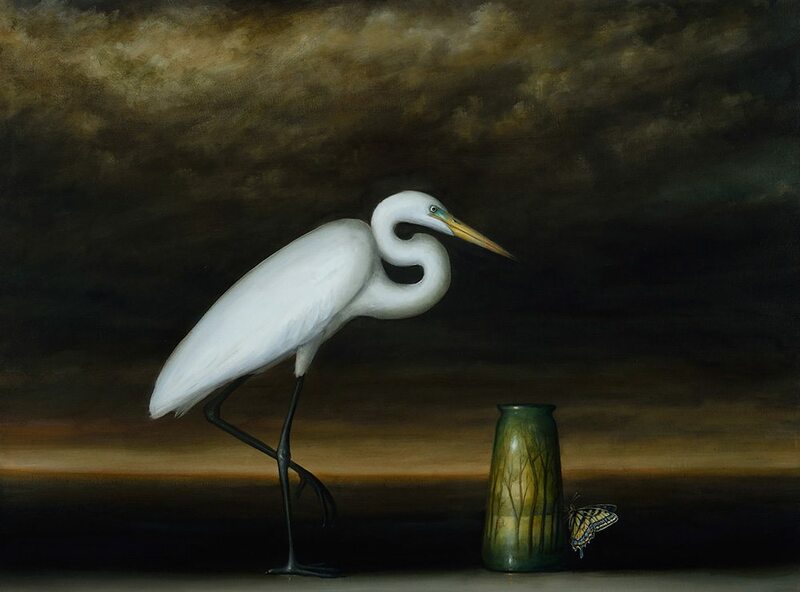 Yet Kroll’s paintings recall the experience of meditating for a moment on a purely natural setting and witnessing as a broad landscape sharpens into a series of dramas and details, as the profound multitude and variety of the natural world reveals itself to us, and life goes about its ceaseless project. 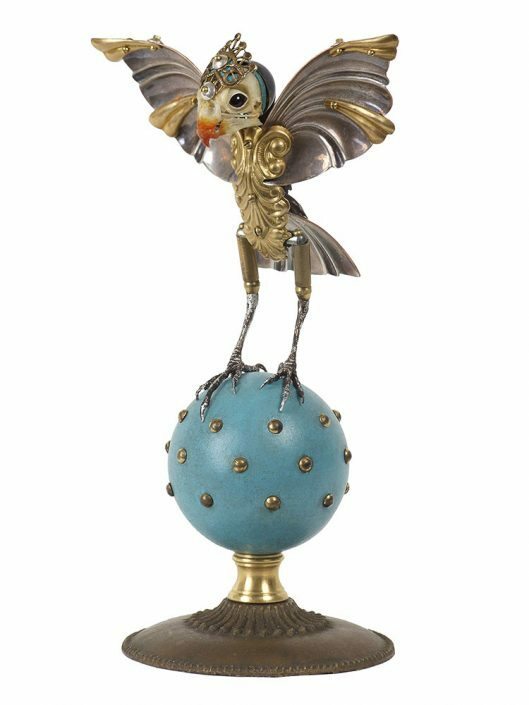 In the formative years of her childhood, the sculptor Jessica Joslin could only see the details of the natural world in one of the many science museums in her hometown of Boston. 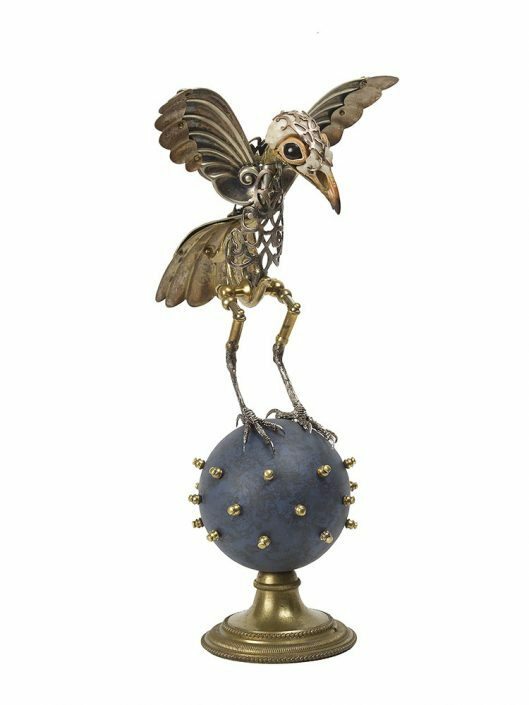 Joslin explains that she was too nearsighted to glimpse natural life in any detail in the wider world, but within the vitrine of museum glass she could study the miraculous detailed anatomy of taxidermy specimens. 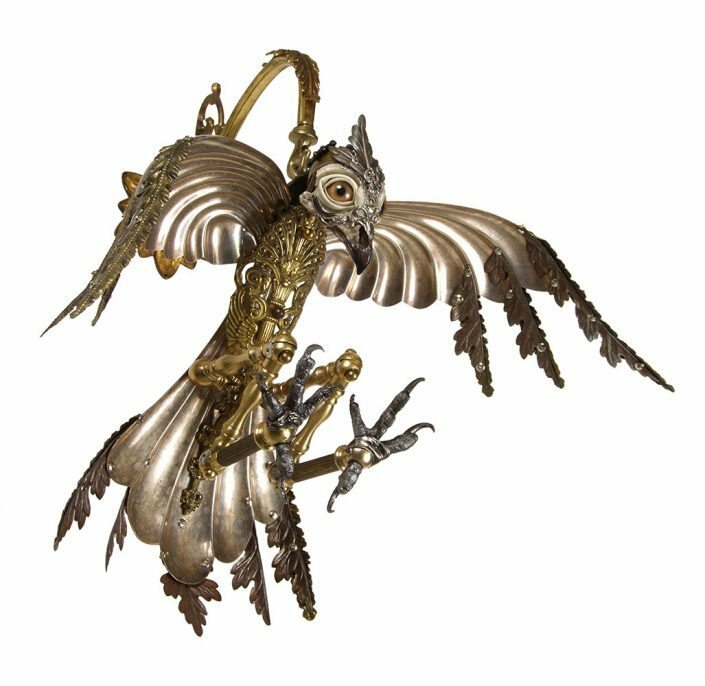 Joslin’s extreme nearsightedness was eventually discovered and corrected, but her fascination with the enigmatic mechanics of natural biology continues, in a zoological garden filled with odd and magical creatures of her own creation. 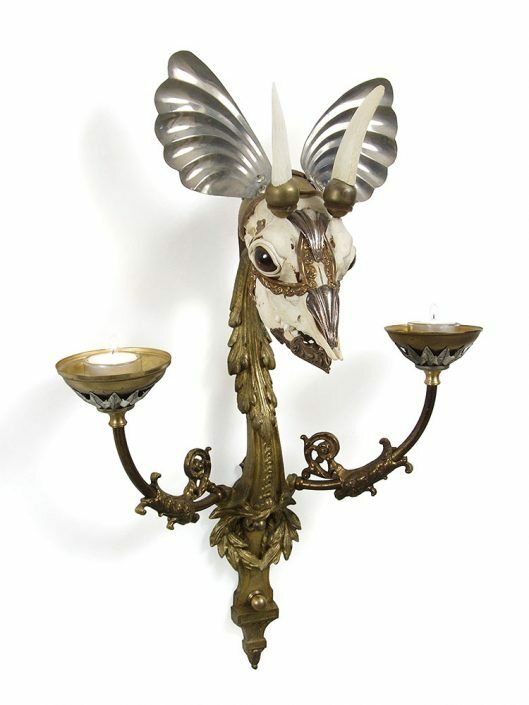 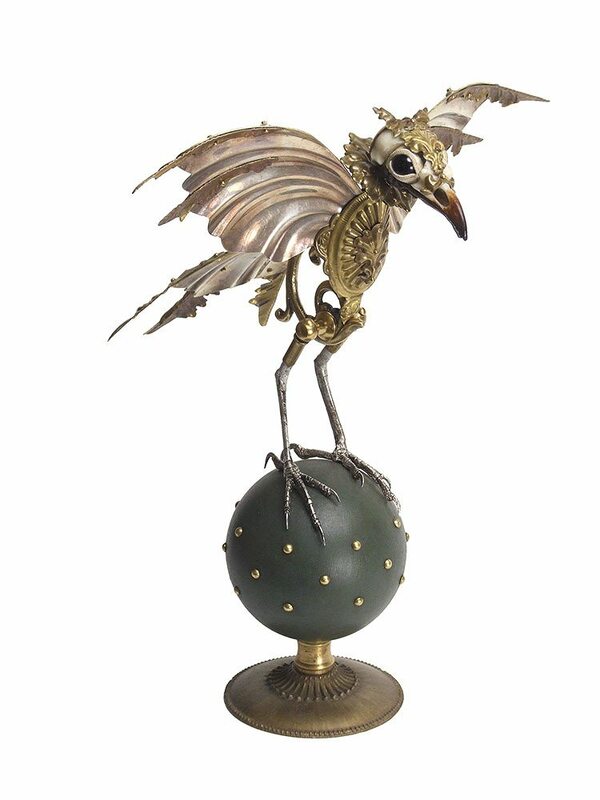 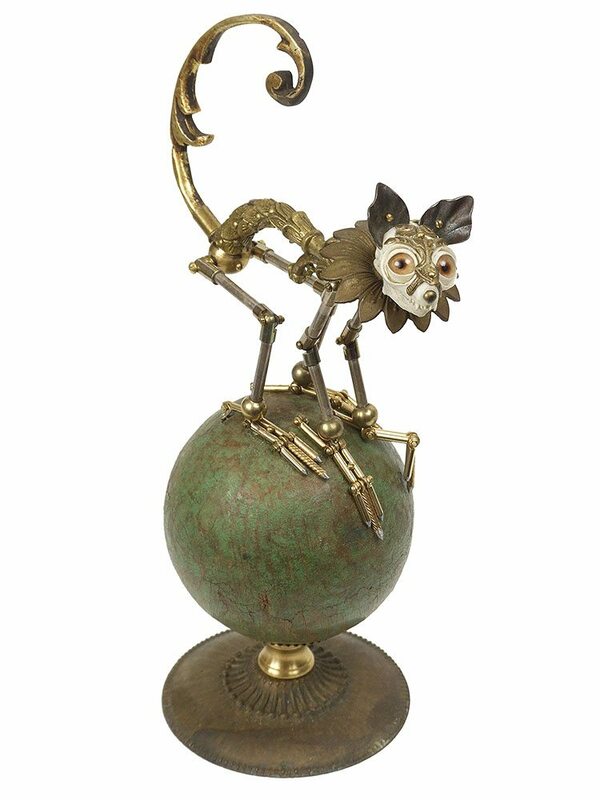 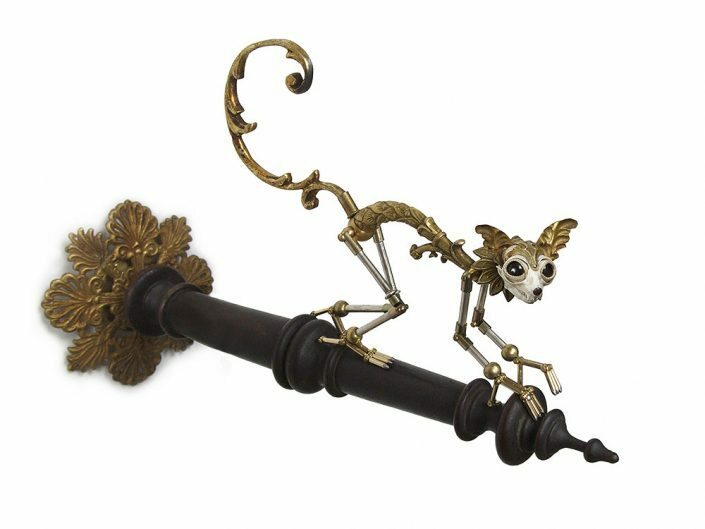 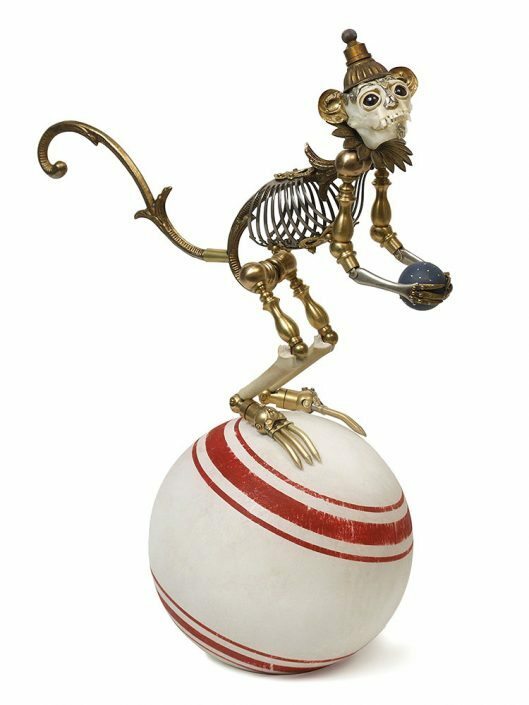 Holding endearing and lifelike poses, Joslin’s strange pets and specimens are made of skeleton parts and antiquated fixtures, sweet baubles and disconcerting anatomies, recalling a reliquary of turn-of-the century circus attractions. Remarkably, Joslin uses no soldering or welding in the creation of these works; mechanical fixtures of various kids are their uniting and animating force. 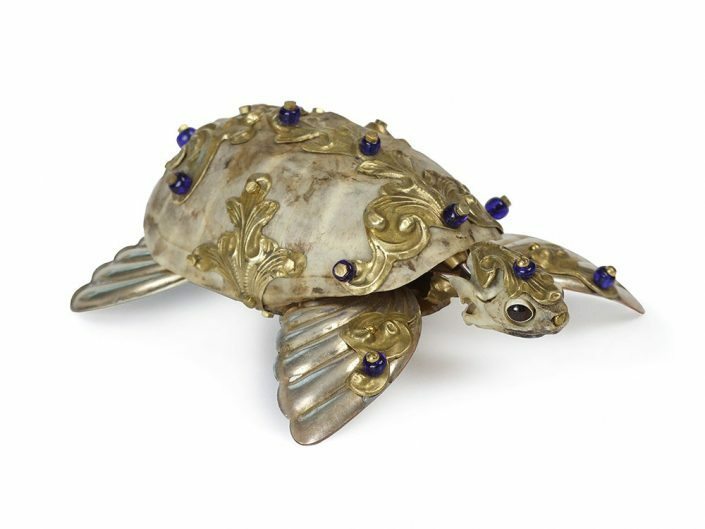 Brass, steel, bone, glass and leather combine to give character and an entreating kind of charm to each piece, a coy invitation to look very, very closely. 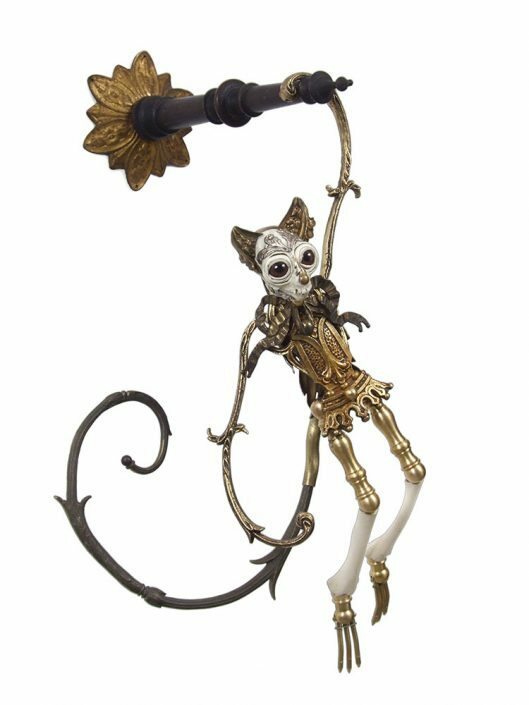 Though domesticated, each creature retains the wild and slightly fearsome aspect of one who cannot be categorized in any earthly taxonomy.